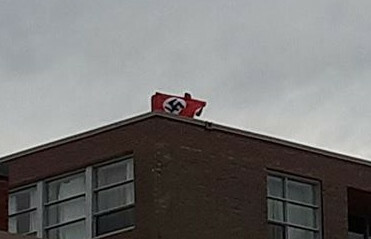 Protesters gathered Saturday night to denounce hate and racism in Parc Extension after a resident waved a nazi flag off the roof of a condo building in the neighborhood on May 1. “This nazi flag is not only offensive to Jewish people, but it’s also been proven to be offensive and dangerous message of anti-diversity,” said Arlene Zimmerman, a Jewish Montrealer whose mother lived through the Holocaust. The resident waved the flag on May 1 as a May Day demonstration by the Industrial Workers’ of the World was underway on Hutchinson St. just below, and made a sieg heil salute at the crowd. 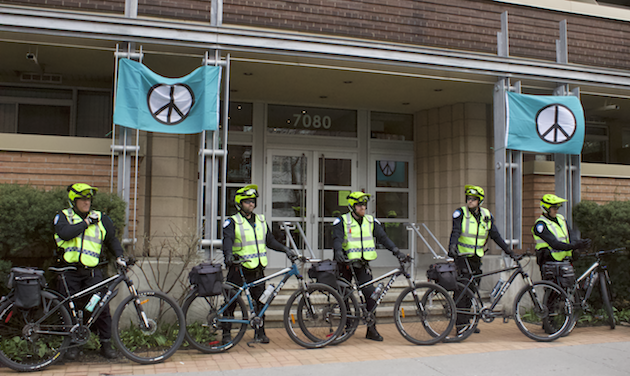 When protesters tried to enter the building to approach the man, Montreal police prevented them from coming through. 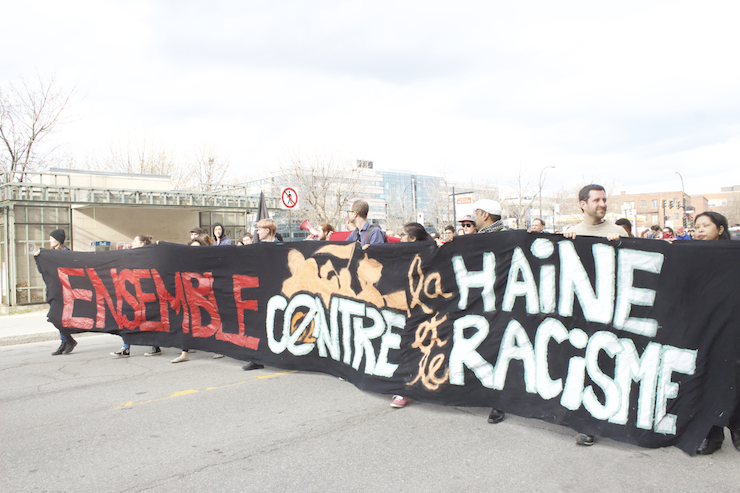 The demonstration of about 100 people circled briefly through the neighbourhood before ending at 7080 Hutchinson St., the condominium where the flag was waved just off of Parc Metro. Zimmerman told the crowd she’s concerned displays like this could result in violence, and said in face of hate Montrealers should celebrate diversity instead. The board of the condominium said in a statement that they reached out to the Montreal police hate crimes unit. After surveillance footage was provided to police, the board then confirmed an investigation into an individual is underway. While that’s in process, locals have remained critical of the condominium’s decision to not disclose the name of the person currently being investigated by police. “We want to make sure that we create a feeling of security (in our neighbourhood),” said Samiha Hossain, who said she’s lived in Parc-Extension her whole life. “We do respect the nature of police investigations, we acknowledge that there is an investigation going on so his identity is protected, but what we are hoping is that once the investigation is concluded that we get to know the identity,” she continued. Others said they distrust the police and so feel the issue should be resolved by the community instead. Hossain said she doesn’t support any form of violent vigilantism. The direction to not disclose the individual’s name was given by Montreal police, who said they can’t make the name public while an investigation is still in course. The board also said that they’ve reached out to the Centre for the Prevention of Radicalization Leading to Violence and to an extremism prevention group in the neighbourhood’s CLSC to help resolve the issue.